Cannibliss® is a health & beauty company focused on using Cannabidiol oil (CBD Oil) as a primary ingredient. Unlike THC, CBD is not psychoactive. This means that it does not change the state of mind of the person who uses it. However, it produces significant changes in the body through the use of Cannabinoid receptors, located throughout the body. Cannabinoid receptors are part of the endocannabinoid system, which is involved in a variety of physiological processes including appetite, pain-sensation, mood, and memory. According to Medical News Today, All cannabinoids, including CBD, attach themselves to certain receptors in the body to produce their effects. The human body produces certain cannabinoids on its own. It has two receptors for cannabinoids, called CB1 receptors and CB2 receptors. CB1 receptors are found all around the body, but many of them are in the brain. The CB1 receptors in the brain deal with coordination and movement, pain, emotions and mood, thinking, appetite, and memories, among others. THC attaches to these receptors. CB2 receptors are more common in the immune system. They affect inflammation and pain. It used to be thought that CBD acts on these CB2 receptors, but it appears now that CBD does not act on either receptor directly. Instead, it seems to influence the body to use more of its own cannabinoids. 1. THC (Tetrahydrocannabinol) - THC is an appetite suppressant with a variety of medical benefits. Some known benefits of THC are that helps fight glaucoma, forms of cancer (particularly in treatment), insomnia, PTSD, and anxiety disorders. 2) CBD (Cannabidiol) - CBD is pure medicine. CBD has a wide range of proven medical effects, chief among them preventing seizures in epileptic children. 3) THCV (Tetrahydrocannabivarin) - Amongst its medical benefits, THCV stimulates bone growth and helps Diabetes as it aids in maintaining blood sugar levels. 4) CBN (Cannabinol) - CBN is thought to share characteristics and benefits of CBD, mainly sleep aid. The calming chemical also has shown promise as an MRSA topical. 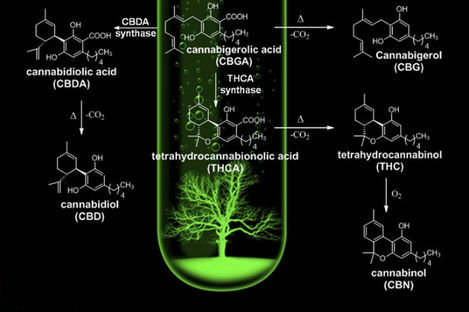 5) CBG (Cannabigerol) - The up-and-coming compound to keep an eye on, CBG has powerful potential as a recent discovery indicates that CBG may well be the parent for both THC and CBD compounds. CBG functions by blocking GABA and relaxing muscles. Both Science and research have shown CBD’s potential as a treatment for a wide range of conditions, which include Crohn’s disease, Arthritis, Diabetes, MS (Multiple Sclerosis), Chronic Pain, Schizophrenia, PTSD (Post Traumatic Stress Syndrome), depression, Epilepsy, and other neurological disorders.